Gag starts out with a simple idea: Peter, a native of Brooklyn, stopped eating 15 years ago. How does he fit into a society that often schedules its activities around eating? His solution is to head to Paris, the food capitol of the world. On the plane ride over, he meets Dallas, a large red-headed Texan man who will challenge Peter’s very notions of what is truth, what is reality—even when Peter doesn’t, or even can’t, believe what he’s hearing. This is a short little book that tends to read with the ferocity of a well-developed post-modern short story (like “Cavemen in the Hedges” or “Stone Animals”). For that reason, I enjoyed it very much. Post-modern stories can often be crazy, whimsical, or downright odd because readers will just go with it for a certain amount of time. Novels can’t make readers suspend disbelief for too long, lest they become silly or ridiculous. Unger flows back and forth between making me disbelieve her characters and making me understand that unusual things happen to people. Just when the plot felt like it couldn’t keep up its strangeness, a character would do something normal, like crochet or go for a walk to reel me back in. “…the inevitable happened: loud, fat, male and smelling slightly of refried beans. At times, though, it seemed like the story was sending a fat-hate message. One character can’t see herself as a woman when she is heavier. At one point, she is so thin that she looks “frail, possibly delicate, like a paper cut-out of herself, yet to [Peter] she looked extraordinarily beautiful.” I was troubled by the idea of a woman looking so different that she is not quite herself, yet this is when she is most gorgeous. The book repeats this message throughout. 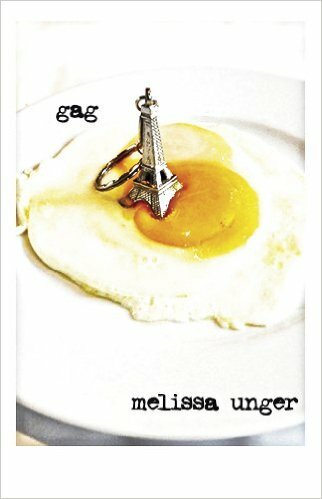 Overall, Gag is a story about trust and secrets, but it’s delivered in a way that seems more about the absurd and metaphor. There are a number of comma splices throughout the book, but if you overlook those, you will enjoy this curious story. So much of what’s great about this book would spoil the story if I discussed it further, so check it for yourself. Intriguing. Great premise, and the tone sounds fun. Not sure about the fat shaming though, either. The best parts of the book I can’t really talk about because I think the author would consider them spoilers. Definitely worth the read, and it’s a small book, so it’s a speedy read! I’m totally going to get it. Sounds good! I like the title! It’s short, but packs in A LOT.